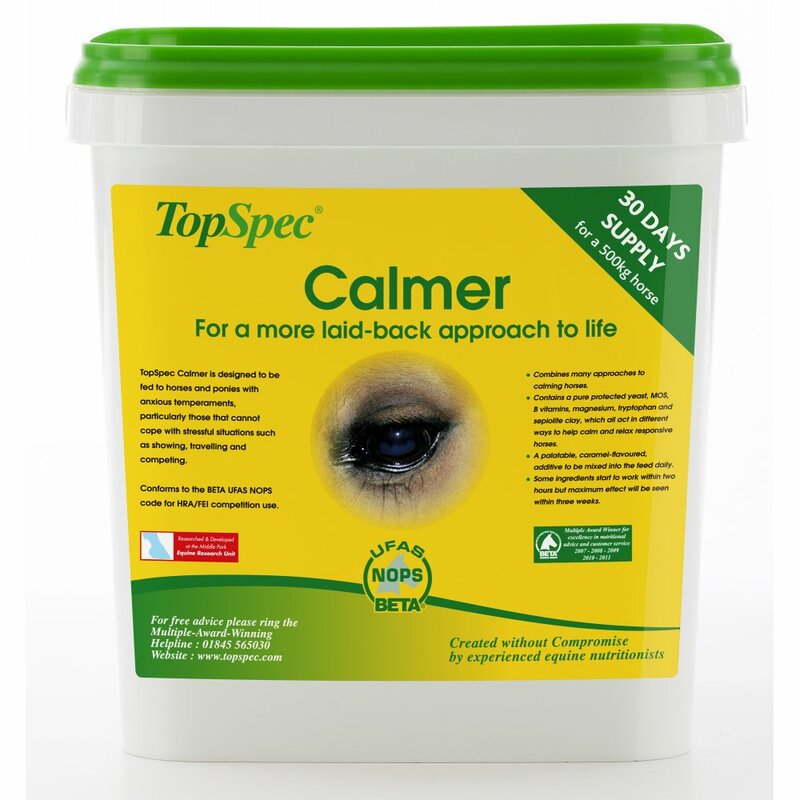 A highly palatable additive, TopSpec Calmer is caramel flavoured and should be blended with damp feed. It can be added to any combination of feeds and supplements. Below are some recent questions we've received regarding Top Spec Calmers for Horses, including answers from our team. Took my horse hunting and he completly freaked out lunging and spinning round and really throw his toys out of the pram. Can you recomend a calmer for this please. You can definitely try one of the magnesium based calmers, such as Top Spec Calmer. This can take the edge of and reduce the type of behaviour you describe. It's effect varies between individuals so there is no guarantee it will be strong enough, especially given a high "excitement" activity such as hunting. To give it the maximum chance of working it should be given for ar least 5 days prior to the day you intend to go out. If not effective enough there is a product called Zylkene which packs a bit more punch which should be given 2 days before and on the day. If you have no success with these type of products then you are in the realms of prescription medications such as a low dose of ACP. It is also likely that the more times you go hunting the less the requirement for calming medications as you horse will get used to it. Hope this helps. This calmer along with most others will contain a small amount of sugar to make them more palatable. Most things your horse eats will contain a small amount of sugar- grass, hay, chaff even if they are soaked or low calorie versions. Given the small quantity of calmer intended to be fed daily it is unlikely to cause much of a problem for your horse though of course I cannot say this with 100% certainty. I have a 14.2h gypsy cob. How long would a tub of this last? It depends on the weight of your horse. If she is chunky then she may be nearly 400-500kg. In that case a 3kg tub will last 30 days. The calmer should be reaching maximum effect after 5-7 days. Calmers seem to work better for some horses than others so the effect you see will be dependent upon your individual horse. What percentage of magnesium is in this product? And in what form, i.e. magnesium oxide, magnesium chloride? And does it blend easily? It is magnesium sulphate in the Top Spec Calmer at 20,000µg per kg. It does blend easily. It is best to mix it with damp feed so that it sticks to the feed and there is no wastage. Yes this product is allowed in competition. It contains no banned substances.